Keep your dogs and you safe and happy this season! With new activities and maybe new people in your house, don’t make assumptions about how your dog will behave. One of my students told me that her Golden Retriever pup, who’d never “counter surfed” before, stole an item off the counter while she was doing extra cooking. The item happened to be a butcher’s knife she’d been using to chop up cheese. Be sure to practice “leave it”, “drop it” and “give”/”trade” before you need it! Dogs sometimes chew on electric cords for tree lights or other electric ornaments. Keep them out of reach, or spray them with a chew deterrent like Bitter Apple. For determined chewers and cords that cannot be moved, run the cord through tubing such as PVC pipes (available from any home supply store). Dogs can break and ingest delicate glass ornaments. Call your vet if this happens. Tinsel, angel hair, garlands, light bulbs, homemade dough ornaments, and fake spray-on snow are all dangerous and may be attractive to some dogs. These are poisonous for dogs if eaten. Keep them out of reach, ideally by giving them to your dog trainer. Coffee, espresso, macadamia nuts, walnuts, and alcohol are also dangerous. Dogs should not get large amounts of fat or gravy, and should never get cooked poultry bones (chicken, turkey, game hen, goose, etc.). Similarly, dogs should not consume quantities of onions or onion powder; and some dogs have a toxic reaction to grapes, raisins, and wine. Many dogs will get an upset stomach with a big change in food routines so think twice before letting your dog clean up all the leftovers. Also make sure that food wrappings like aluminum foil and plastic wrap go in secured garbage cans. Some dogs will drink the water out of the tree base, and this might not be good for them, especially if you’ve added anything to help prolong the life of the tree. Tree preservatives sometimes have sugar, which make the water attractive to the dog, and fertilizers that can sicken them. Make sure your dog is warm enough! Short-haired dogs are especially susceptible to the cold. Consider a heated bedpad, extra blankets, or even a space heater if your dog sleeps in an unheated area, and a sweater or jacket when your dog goes out. Consider booties for cold ground. Have an “escape plan” if you are out with your dog (looking at lights, caroling, visiting friends) and you notice your dog is getting cold. (People in the Southern Hemisphere, make sure your dog is cool enough over the Christmas holidays!). 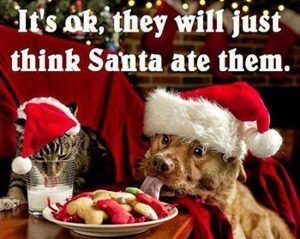 They’ll just think Santa ate them! Place lit candles and oil lamps where your dog can’t knock them over (watch out for that Labrador table-sweeping tail!). Consider LED candles instead. Make sure that fireplaces have secure metal screen. Poinsettias, holly, mistletoe, amaryllis, Christmas cactus, and potpourri – these pretty decorative plants are poisonous if eaten. Keep them out of your dog’s reach. 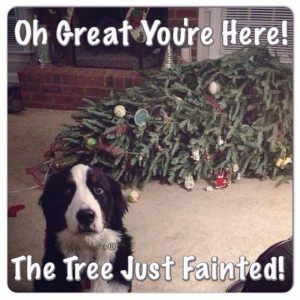 Christmas trees needles can cause vomiting and diarrhea and irritation to the mouth and stomach of a dog who eats them. Make sure your dog isn’t interested (perhaps with some Bitter Apple) or can’t get to them. The toll-free number for National Animal Poison Control Center is 888-4ANI-HELP or 888-426-4435. Plan now for what you will do for your dog if an emergency situation occurs. Find out your vet’s holiday hours, and where the closest emergency or after-hours vet’s office is. The toll-free number for National Animal Poison Control Center is 888-4ANI-HELP or 888-426-4435. If you are travelling out of the area with your dog, find out where the host town’s emergency vets are (and make sure you bring your pet’s medical records with you). 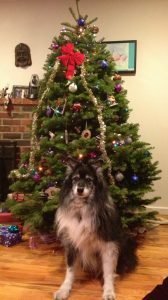 Christmas trees – You might want to keep the dog and the tree entirely separated. In addition to the dangers listed above, there is a LOT of trouble your dog can get into! So many ornaments look like toys, cords can be tripped over and pulled out, whole trees can be knocked over by rambunctious dogs, or even peed on by determined markers! Use a baby gate or door to keep the dog out of the room with the tree, or put a fence like an exercise pen (“ex-pen”) around it. Gifts – Keep them out of the dog’s reach – you don’t want the dog chewing them up! House guests – Before guests arrive, train your dog to greet people politely, to come to you when you call, and to settle down in a quiet, out-of-the-way place, such as the dog’s crate. Have some favorite chew toys or stuffed Kongs ready to give your dog to occupy him or her while you entertain. Make sure the dog has a place to go to escape raucous parties! If you are traveling out of town for the holidays, prepare your dog in advance. Think twice about taking your dog with you by plane, since traveling in the cargo hold can be dangerous (especially in cold weather) and very stressful. Traveling by car is easier for dogs who are used to car travel; the safest way is in a crate. Be sure to stop frequently for “relief”. Before you leave, check that your destination will accept dogs, whether it’s a hotel or a relative’s house. And it’s a good idea to get a temporary tag for your dog which lists a phone number you can be reached at during your trip. If you are traveling without your dog, plan your dog’s boarding in advance. Many boarding kennels fill up during holidays. Check out any kennel you are considering. Make sure that there’s enough room for your dog. And it’s a good idea to find out if the boarding kennel has an emergency plan to make sure all of the animals are kept warm, safe, and secure. Check that they have a disaster plan for getting all of the animals out and keeping them somewhere else if a disaster happens. Check out the Events page for some fun holiday things you can do with your dog, including getting your pet’s photo taken with Santa! Thanks to Heather Campbell, Sidney Hardie, Dino Candelaria, and Dr. Sharon Brandt, in contributing to this! 3. Remove scissors from older dog’s mouth. 6. Remove tape from older dog’s mouth. 9. Remove present from puppy’s mouth. 11. Take scissors from older dog & sit on them. 12. Remove puppy from box & put on lid. 16. Cut paper being careful not to cut puppy’s foot or nose that is getting in the way as it “helps”.